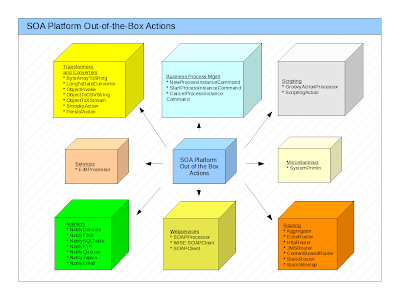 In reviewing my last two posts to this blog, I realized that I've actually been describing several of the JBoss SOA Platform's out-of-the-box actions in an ad hoc manner. I thought that this might be a good time to take a step back and review the platform's full set of out-of-the-box actions. Which got me thinking about how useful it is when a tool works "right of of the box" and how disappointing it can be when it doesn't. In his book "Diary of a Wimpy Kid, The Last Straw," author Jeff Kinney has the main character, angst-ridden middle school student Greg Heffley, finds an ad for "personal hovercraft" in a comic book. Greg imagines himself as the coolest kid in school if he could get his own hovercraft, so he sends all his saved-up money away for one. He is, of course, disappointed when he opens the box and finds not a functioning personal hovercraft, but the plan to build one. Step one in the plan reads: "Acquire an industrial twin-turbine engine." Let's take a quick look at all of these actions, and then a more in-depth look at a couple of them. These actions are needed to enable services that expect data in different forms to communicate with each other. What transformers and converters do is to translate message payloads into different forms. 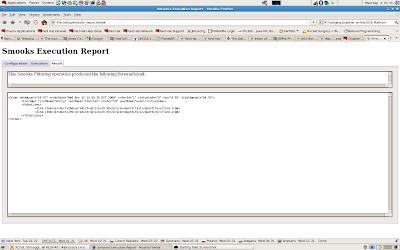 Let's stop for a minute and review the contents of messages as they are passed over the JBossESB in the SOA Platform. 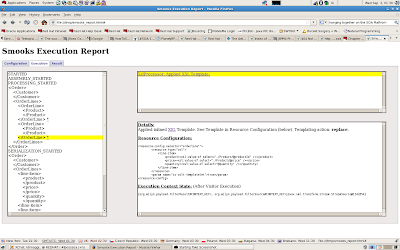 Messages implement the org.jboss.soa.esb.message.Message interface. From the point of view of a service, the data in a message, in other words, the message "payload" consists of the message body plus attachments and properties. The default way for an action to get or set a message payload is the MessagePayloadProxy utility class. This class is important as it provides a standard way to get the message payload. ObjectInvoke (org.jboss.soa.esb.actions.converters.ObjectInvoke) - Things start to get a little more interesting with the ObjectInvoke converter. This action takes a serialized object, which constitutes the entire Message payload, and passes it to a configured processer class. The processed results become the new message payload. The action lets you use your own POJOs as the message payloads. ObjectToCSVString (org.jboss.soa.esb.actions.converters.ObjectToCSVString) - This action converts a message into a comma separated string based on a list of property names that you supply. ObjectToXStream (org.jboss.soa.esb.actions.converters.ObjectToXStream) - This action is similar to the ObjectInvoke action, except that it converts the object to XML using XStream. You've probably already guessed that the XStreamToObject action converts XML to an object using XStream. PersistAction (org.jboss.soa.esb.actions.MessagePersister) - This action doesn't really transform or convert a message, it writes it to the persistent message store. The most common use of the action is that it is how the SOA Platform itself writes messages to the dead letter queue (DLQ), but it can be used in any situation when you want to store a message. NewProcessInstanceCommand creates a new ProcessInstance using a process definition that has already been deployed to jBPM. The process instance is left in the start state so that tasks referenced by start node are executed. StartProcessInstanceCommand is the same as NewProcessInstanceCommand, except that the process instance that is created is moved from the start position to the first node in the process graph. As its name implies, CancelProcessInstanceCommand cancels a process instance. This group of actions makes it possible for you to create custom actions using scripting languages. As of release 4.3 of the SOA Platform, scripting actions in Groovy and Bean Scripting Framework (BSF) are supported. Both these actions accept the message payload and configuration data such as a Log4J logger as variables for the script that is executed by the action. In addition, they both support having scripting contained within the message itself. There's only one action in this group, but it's an important one. Aggregator (org.jboss.soa.esb.actions.Aggregator) - This is an interesting one. The Aggregator, as its name indicates, aggregates information together. This action enables you to combine information from multiple messages into one message. The Aggregator action is an implementation of the Aggregator Enterprise Integration Pattern. EchoRouter (org.jboss.soa.esb.actions.routing.EchoRouter) - In contrast, the EchoRuter just logs and returns the incoming message. ContentBasedRouter (org.jboss.soa.esb.actions.ContentBasedRouter) - I described content based routing with JBoss Rules in an earlier post to this blog http://jboss-soa-p.blogspot.com/2009/07/when-content-knows-way-content-based.html). Content based routing is a flexible approach to message routing in that the content in a message is actually the determining factor in determining the route a message takes. StaticWiretap (org.jboss.soa.esb.actions.StaticWiretap) - Maybe it's the comic book fan in me, but this is my favorite name for an action. There's something film noir-ish about a "wiretap." You can almost imagine Humphrey Bogart sitting it the back room of a bar listening in on a wiretapped SOA action. (On black and white film, of course.) In practice, it's not all that exciting. This action implements the Enterprise Integration Pattern for a wiretap. The goal of a wiretap is to inspect each message, without affecting the operation of the action chain. This can be a useful action to use to aid in debugging a service. Just as a gateway listener enables you to move ESB-unaware messages (in other words, messages in a format other than (org.jboss.soa.esb.message.Message) onto the SOA Platform's ESB, notifiers (org.jboss.soa.esb.actions.Notifier) enable you to move ESB-aware messages from the ESB to ESB-unaware services. The notifiers convert the ESB-aware messages into data into formats that these services can understand. When you're considering web services and the SOA Platform, you actually have two separate goals to achieve; you want to be able to expose webservice endpoints as services and you also want to be able to invoke web services from actions defined in a service. WISE SOAPClient (org.jboss.soa.esb.actions.soap.wise.SOAPClient) - This action uses the WISE client service (org.jboss.wise.core.client.WSService) to create a JAX-WS (Java API for XML Web Services) client class and then call the target service. WISE stands for "Wise Invokes Services Easily" and enables the dynamic generation of a client to access web services, without your having to write the code for the client. (This is referred to as "zero-code web service invocation"). SOAPClient (org.jboss.soa.esb.actions.soap.SOAPClient) - This action, uses the soapUI Client Service (org.jboss.soa.esb.services.soapui.SoapUIClientService) to create a message and then route that message to the target service. We've already walked through how to use some of the out of the box actions (Business Process Management, Routing, Notifiers) in earlier posts to this blog. Now, let's look at some examples of other types of out of the box actions. As always, the "quickstart" programs in the SOA Platform provide the example code. Line 25: This line is not specific to transformations, but it's worth mentioning. "mep" stands for "message exchange pattern." The pattern used by this quickstart is "one-way" in that the requester invokes a service (by sending it a message) and then does not wait for a response. Line 30: And here is the XSLT that will be executed. We'll examine this file in a moment. Line 31: This line is actually not in the quickstart. I've added the reportPath property it so that we can review the resulting report. Note that generating this report does require some processing resources, so it should not be used in production environments. See below for screen-shots of this report. Lines 7-9: These XPath (XML Path Language)  statements locate the Product element's productId and price attributes and the OrderLine element's quantity attributes. XPath is used by XSLT to find or reference data in XML documents. Another important feature of the SOA Platform is its ability to publish web services as services. Remember how we talked about how the JBossESB included in the SOA Platform made it possible to deploy web service endpoints as endpoints on the ESB? The services can then also be accessed through other transports (FTP, JMS, etc.) supported by the JBossESB in the SOA Platform. We'll look first at the webservice_producer quickstart. This quickstart demonstrates how to expose a JSR181 web service endpoint on the JBossESB within the SOA Platform by using the org.jboss.soa.esb.actions.soap.SOAPProcessor action. Line 17: The definition of the web service. Lines 24-31: The definition of the method in the web service to be invoked when the action is triggered. The last quickstart we'll look at is webservice_consumer1 - as you can guess by its name, this quickstart demonstrates how to access (or "consume") a JSR181 Web Service in an ESB action by using the org.jboss.soa.esb.actions.soap.SOAPClient action. Pay attention to the "toWhome" parameter. We'll look for this in the web service request. 45   * Convert the message into a webservice request map. Line 54 - The towhome parameter added as the key in a hashmap for the msg body. The key of the HashMap is an Object-Graph Navigation Language (OGNL) expression that identifies the SOAP parameter to be populated with the key's corresponding value. OGNL is an expression language for getting and setting Java objects properties. 45   * Retrieve and output the webservice response. Line 41: The SOAPClient class makes the call to the webservice. This is the "zero-code web service invocation" that we mentioned earlier in the post. Line 44: The parameter responseAsOgnlMap tells the JBossESB move the SOAP response data into that OGNL-based map and attach it to the message. Line 45: The reference to the method to be invoked in the web service. http://www.enterpriseintegrationpatterns.com/Aggregator.html The patterns described at this site and in the corresponding book were created to assist designers and implementers in creating enterprise software solutions. The patterns are platform and language agnostic, so they can be very helpful across many systems. As always, I'd like to thank the members of the SOA Platform project for their help and timely review comments! Also, this post relies heavily on the extensive SOA Platform documents and the quickstarts.